In an epic final battle between an aggressive red and an aggressive blue deck, red mage Etienne Busson defeated Hall of Famer Gabriel Nassif to become champion of Grand Prix Lille 2018! The hashtag for Grand Prix Lille is #GPLille. Join the conversation. When one of the strongest strategies of the previous Standard season—Mono-Red with Goblin Chainwhirler—met one of the most impressive new additions from Guilds of Ravnica—Experimental Frenzy—the combination seemed destined for glory. Then again, the set brought a whole lot of impressive additions for everyone and also created new archetypes all over. In fact, Mono-Red Aggro's presence was dwarfed by Golgari, Jeskai, Izzet, and even Selesnya at basically each and every turn this weekend. Only two players won a Trial with it on Friday, none went 8-0 on Saturday, it amounted to about four percent of the Sunday field, it was barely shown on camera all day long, and a scant two red mages made it to the Top 37. One of them, however, was Switzerland's Etienne Busson, and he was determined to make his second Top 8 at a Standard Grand Prix count. In the semifinals Busson beat the reigning World Champion (7) Javier Dominguez in two straight games, and in the finals he did the same to French Hall of Famer Gabriel Nassif! 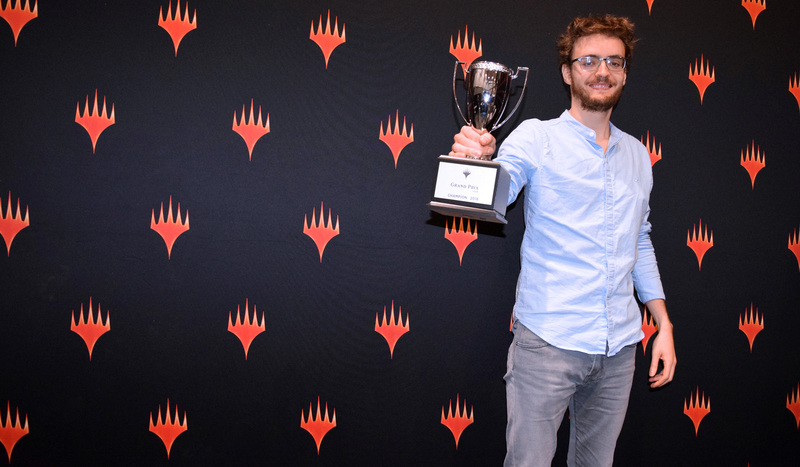 Congratulations to Etienne Busson, champion of Grand Prix Lille 2018! Hot off the printing presses and store shelves, Guilds of Ravnica has already taken over the format. All day long, Phoenixes were shining their Arclight, Loxodons were being venerated, runaway experiments were being conducted in a steam-powered frenzy, and the Golgari were swarming as usual. After eight rounds, the original field of 1,339 was cut down to 277, and eleven players got to enjoy their evening with their perfect records of 8-0 still intact: Florian Trotte, Renato Spinelli, Francesco Giorgio, Rob Catton, Harry Garbett, Michael Blanc, Carlos Moral, Peter Vieren, Thomas Diedic, Alexandre Darras, and Thomas Angel. Congrats! Join us and them and 266 others tomorrow—for decklists, for more Standard action, and for the conclusion of Grand Prix Lille 2018!